Heat oven to 350°F. Spray 3 (8-inch) round cake pans with cooking spray. Line bottom of each pan with cooking parchment paper. Spread 1/2 cup red velvet batter in bottom of each pan. Loosely cover and refrigerate remaining batter. Place all 3 pans on oven rack positioned in centre of oven. Bake about 8 minutes or until cake is set when lightly touched in center. For next cake layer, spread 1/2 cup white batter evenly over each baked red velvet layer. Bake 8 to 10 minutes or until cake is set when lightly touched in centre. Repeat steps 4 and 5, twice, baking 9 to 12 minutes per layer or until top of cake layer is set when lightly touched in centre. Meanwhile, in large bowl, beat marshmallow creme, butter, vanilla and 1 tablespoon milk with electric mixer on medium speed until blended. Beat in icing sugar until fluffy. If necessary, beat in more milk, a few drops at a time until spreading consistency. 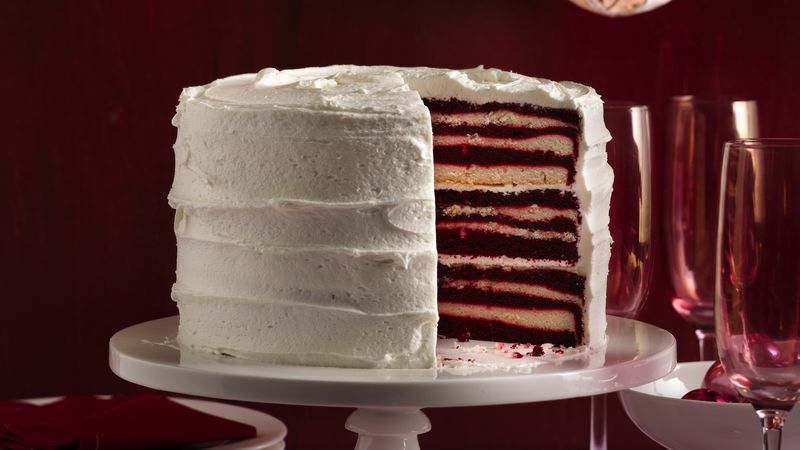 To assemble, stack cake layers, spreading 1/2 cup frosting between each layer. Spread thin layer of frosting over side and top of cake to seal in crumbs. Refrigerate cake 30 to 45 minutes to set frosting. Spread remaining frosting on side and top of cake. In a pinch for time but still want to make this impressive layer cake? You can replace the homemade frosting with 3 containers Betty Crocker™ Whipped fluffy white frosting.